Wow! That’s a mouthful. In simpler words, Docker is a tool that allows developers, sys-admins etc. to easily deploy their applications in a sandbox (called containers) to run on the host operating system i.e. Linux. The key benefit of Docker is that it allows users to package an application with all of its dependencies into a standardized unit for software development. Unlike virtual machines, containers do not have the high overhead and hence enable more efficient usage of the underlying system and resources. Docker’s rise has been nothing short of meteoric. Although containers by themselves are not a new technology, it was not until Docker arrived that they started to get mainstream attention. By providing standard APIs that made containers easy to use and creating a way for the community to collaborate around libraries of containers, Docker has radically changed the face of the technology landscape. In an article published by The Register in mid-2014, it was claimed that Google runs over two billion containers per week. In addition to Docker’s continual growth, Docker, Inc., the developer behind Docker has been valued at over a billion dollars! Due to its benefits of efficiency and portability, Docker has been gaining mind share rapidly, and is now leading the Containerization movement. As developers going out into the world, it is important that we understand this trend and see how we can benefit from it. This tutorial aims to be the one-stop shop for getting your hands dirty with Docker. Apart from demystifying the Docker landscape, it’ll give you hands-on experience with building and deploying your own webapps on the Cloud. We’ll be using Amazon Web Services to deploy a static website, and two dynamic webapps on EC2 using Elastic Beanstalk and Elastic Container Service. Even if you have no prior experience with deployments, this tutorial should be all you need to get started. Note: This tutorial uses version 1.12.0-rc2 of Docker. If you find any part of the tutorial incompatible with a future version, please raise an issue. Thanks! Now that we have everything setup, it’s time to get our hands dirty. In this section, we are going to run a Busybox container on our system and get a taste of the docker run command. Note: Depending on how you’ve installed docker on your system, you might see a permission denied error after running the above command. If you’re on a Mac, make sure the Docker engine is running. If you’re on Linux, then prefix your docker commands with sudo. Alternatively you can create a docker group to get rid of this issue. Great! Let’s now run a Docker container based on this image. To do that we are going to use the almighty docker run command. Wait, nothing happened! Is that a bug? Well, no. Behind the scenes, a lot of stuff happened. When you call run, the Docker client finds the image (busybox in this case), loads up the container and then runs a command in that container. When we run docker run busybox, we didn’t provide a command, so the container booted up, ran an empty command and then exited. Well, yeah – kind of a bummer. Let’s try something more exciting. Nice – finally we see some output. In this case, the Docker client dutifully ran the echo command in our busybox container and then exited it. If you’ve noticed, all of that happened pretty quickly. Imagine booting up a virtual machine, running a command and then killing it. Now you know why they say containers are fast! Ok, now it’s time to see the docker ps command. The docker ps command shows you all containers that are currently running. Danger Zone: If you’re feeling particularly adventurous you can try rm -rf bin in the container. Make sure you run this command in the container and not in your laptop. Doing this will not make any other commands like ls, echo work. Once everything stops working, you can exit the container (type exit and press Enter) and then start it up again with the docker run -it busybox sh command. Since Docker creates a new container every time, everything should start working again. That concludes a whirlwind tour of the mighty docker run command, which would most likely be the command you’ll use most often. It makes sense to spend some time getting comfortable with it. To find out more about run, use docker run --help to see a list of all flags it supports. As we proceed further, we’ll see a few more variants of docker run. Before we move ahead though, let’s quickly talk about deleting containers. We saw above that we can still see remnants of the container even after we’ve exited by running docker ps -a. Throughout this tutorial, you’ll run docker run multiple times and leaving stray containers will eat up disk space. Hence, as a rule of thumb, I clean up containers once I’m done with them. To do that, you can run the docker rm command. Just copy the container IDs from above and paste them alongside the command. This command deletes all containers that have a status of exited. In case you’re wondering, the -q flag, only returns the numeric IDs and -f filters output based on conditions provided. One last thing that’ll be useful is the --rm flag that can be passed to docker run which automatically deletes the container once it’s exited from. For one off docker runs, --rm flag is very useful. Images – The blueprints of our application which form the basis of containers. In the demo above, we used the docker pull command to download the busybox image. Containers – Created from Docker images and run the actual application. We create a container using docker run which we did using the busybox image that we downloaded. A list of running containers can be seen using the docker ps command. Docker Daemon – The background service running on the host that manages building, running and distributing Docker containers. The daemon is the process that runs in the operating system to which clients talk to. Docker Client – The command line tool that allows the user to interact with the daemon. More generally, there can be other forms of clients too – such as Kitematic which provide a GUI to the users. Docker Hub – A registry of Docker images. You can think of the registry as a directory of all available Docker images. If required, one can host their own Docker registries and can use them for pulling images. Let’s start by taking baby-steps. The first thing we’re going to look at is how we can run a dead-simple static website. We’re going to pull a Docker image from Docker Hub, run the container and see how easy it is to run a webserver. Let’s begin. The image that we are going to use is a single-page website that I’ve already created for the purpose of this demo and hosted on the registry – prakhar1989/static-site. We can download and run the image directly in one go using docker run. Since the image doesn’t exist locally, the client will first fetch the image from the registry and then run the image. If all goes well, you should see a Nginx is running... message in your terminal. Okay now that the server is running, how do see the website? What port is it running on? And more importantly, how do we access the container directly from our host machine? Well in this case, the client is not exposing any ports so we need to re-run the docker run command to publish ports. While we’re at it, we should also find a way so that our terminal is not attached to the running container. This way, you can happily close your terminal and keep the container running. This is called detached mode. Note: If you’re using docker-toolbox, then you might need to use docker-machine ip default to get the IP. To stop a detached container, run docker stop by giving the container ID. I’m sure you agree that was super simple. To deploy this on a real server you would just need to install Docker, and run the above Docker command. 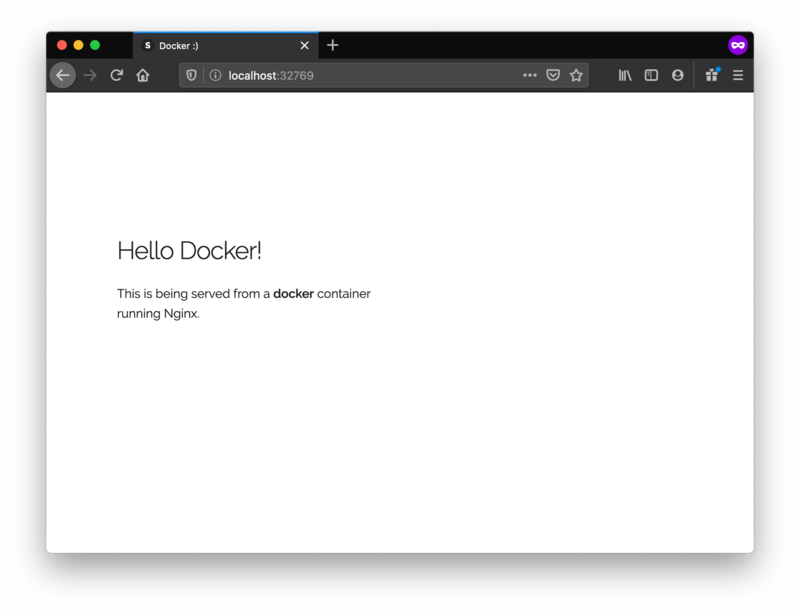 Now that you’ve seen how to run a webserver inside a Docker image, you must be wondering – how do I create my own Docker image? This is the question we’ll be exploring in the next section. We’ve looked at images before, but in this section we’ll dive deeper into what Docker images are and build our own image! Lastly, we’ll also use that image to run our application locally and finally deploy on AWS to share it with our friends! Excited? Great! Let’s get started. The above gives a list of images that I’ve pulled from the registry, along with ones that I’ve created myself (we’ll shortly see how). The TAG refers to a particular snapshot of the image and the IMAGE ID is the corresponding unique identifier for that image. Official images are images that are officially maintained and supported by the folks at Docker. These are typically one word long. In the list of images above, the python, ubuntu, busybox and hello-world images are base images. The next step now is to create an image with this web app. As mentioned above, all user images are based off of a base image. Since our application is written in Python, the base image we’re going to use will be Python 3. More specifically, we are going to use the python:3-onbuild version of the python image. What’s the onbuild version you might ask? In other words, the onbuild version of the image includes helpers that automate the boring parts of getting an app running. Rather than doing these tasks manually (or scripting these tasks), these images do that work for you. We now have all the ingredients to create our own image – a functioning web app and a base image. How are we going to do that? The answer is – using a Dockerfile. A Dockerfile is a simple text-file that contains a list of commands that the Docker client calls while creating an image. It’s a simple way to automate the image creation process. The best part is that the commands you write in a Dockerfile are almost identical to their equivalent Linux commands. This means you don’t really have to learn new syntax to create your own dockerfiles. The application directory does contain a Dockerfile but since we’re doing this for the first time, we’ll create one from scratch. To start, create a new blank file in our favorite text-editor and save it in the same folder as the flask app by the name of Dockerfile. The next step usually is to write the commands of copying the files and installing the dependencies. Luckily for us, the onbuild version of the image takes care of that. The next thing we need to the specify is the port number that needs to be exposed. Since our flask app is running on port 5000, that’s what we’ll indicate. The section below shows you the output of running the same. Before you run the command yourself (don’t forget the period), make sure to replace my username with yours. This username should be the same one you created when you registered on Docker hub. If you haven’t done that yet, please go ahead and create an account. The docker build command is quite simple – it takes an optional tag name with -t and a location of the directory containing the Dockerfile. If you don’t have the python:3-onbuild image, the client will first pull the image and then create your image. Hence, your output from running the command will look different from mine. Look carefully and you’ll notice that the on-build triggers were executed correctly. If everything went well, your image should be ready! Run docker images and see if your image shows. What good is an application that can’t be shared with friends, right? So in this section we are going to see how we can deploy our awesome application to the cloud so that we can share it with our friends! 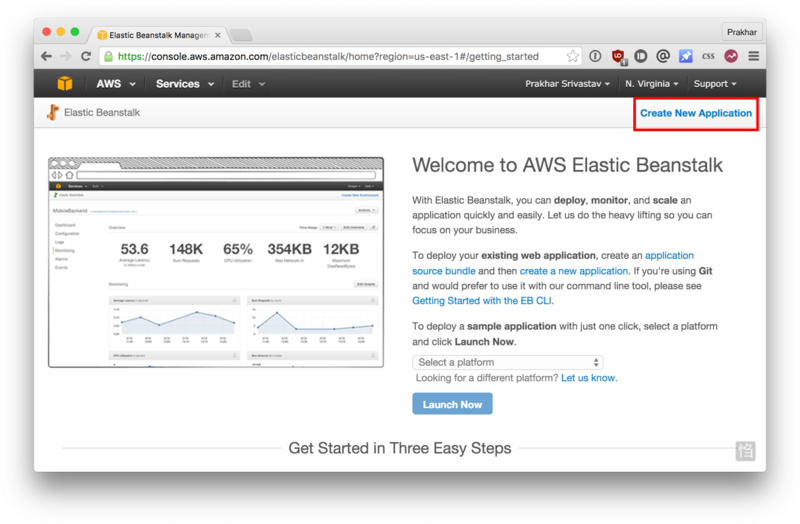 We’re going to use AWS Elastic Beanstalk to get our application up and running in a few clicks. We’ll also see how easy it is to make our application scalable and manageable with Beanstalk! Once that is done, you can view your image on Docker Hub. For example, here’s the web page for my image. Note: One thing that I’d like to clarify before we go ahead is that it is not imperative to host your image on a public registry (or any registry) in order to deploy to AWS. In case you’re writing code for the next million-dollar unicorn startup you can totally skip this step. The reason why we’re pushing our images publicly is that it makes deployment super simple by skipping a few intermediate configuration steps. If you’ve pulled your hair in setting up local dev environments / sharing application configuration in the past, you very well know how awesome this sounds. That’s why Docker is so cool! 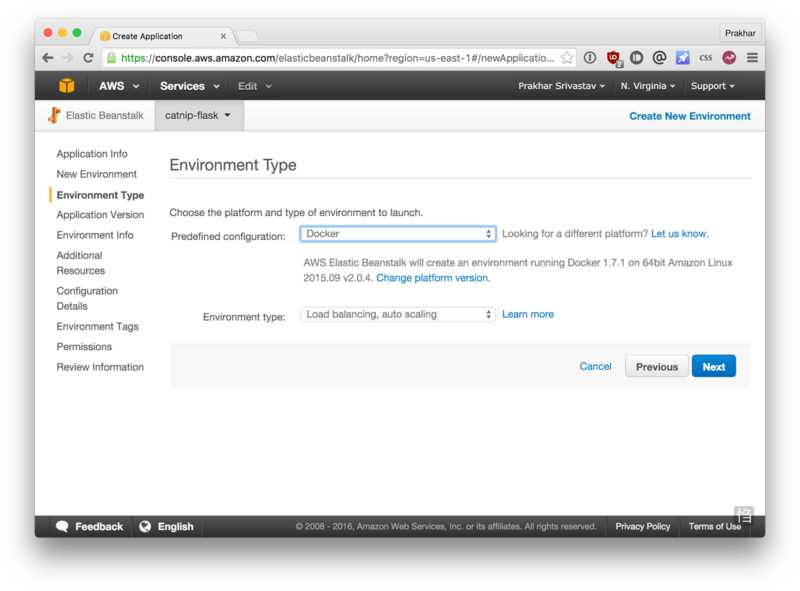 AWS Elastic Beanstalk (EB) is a PaaS (Platform as a Service) offered by AWS. If you’ve used Heroku, Google App Engine etc. you’ll feel right at home. As a developer, you just tell EB how to run your app and it takes care of the rest – including scaling, monitoring and even updates. In April 2014, EB added support for running single-container Docker deployments which is what we’ll use to deploy our app. Although EB has a very intuitive CLI, it does require some setup, and to keep things simple we’ll use the web UI to launch our application. To follow along, you need a functioning AWS account. If you haven’t already, please go ahead and do that now – you will need to enter your credit card information. But don’t worry, it’s free and anything we do in this tutorial will also be free! Let’s get started. This is where we need to tell EB about our image. 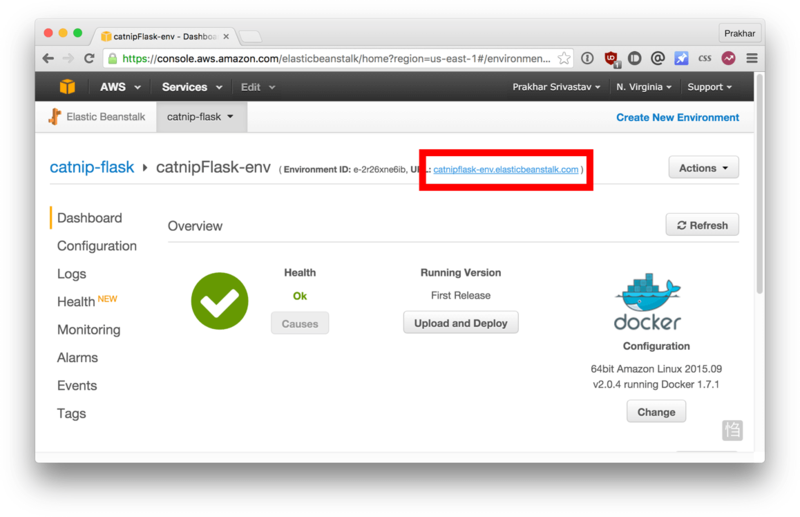 Open the Dockerrun.aws.json file located in the flask-app folder and edit the Name of the image to your image’s name. Don’t worry, I’ll explain the contents of the file shortly. When you are done, click on the radio button for « upload your own » and choose this file. Next up, choose an environment name and a URL. This URL is what you’ll share with your friends so make sure it’s easy to remember. For now, we won’t be making changes in the Additional Resources section. Click Next and move to Configuration Details. In this section, all you need to do is to check that the instance type is t1.micro. This is very important as this is the free instance by AWS. You can optionally choose a key-pair to login. If you don’t know what that means, feel free to ignore this for now. We’ll leave everything else to the default and forge ahead. We also don’t need to provide any Environment Tags and Permissions, so without batting an eyelid, you can click Next twice in succession. At the end, the screen shows us the Review page. If everything looks good, go ahead and press the Launch button. While we wait, let’s quickly see what the Dockerrun.aws.json file contains. This file is basically an AWS specific file that tells EB details about our application and docker configuration. 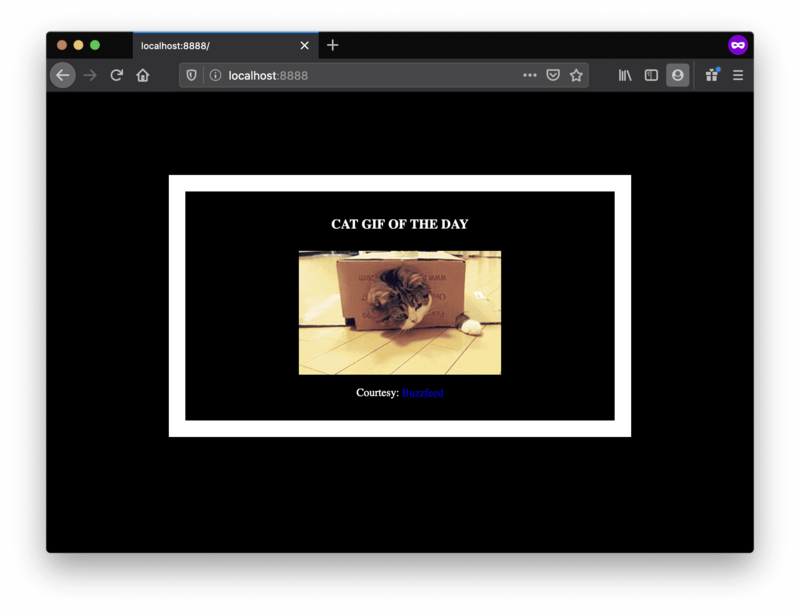 In the next (and final) part of the tutorial, we’ll up the ante a bit and deploy an application that mimics the real-world more closely; an app with a persistent back-end storage tier. Let’s get straight to it! Those of you who have experience running services in production know that usually apps nowadays are not that simple. There’s almost always a database (or any other kind of persistent storage) involved. Systems such as Redis and Memcached have become de riguer of most web application architectures. Hence, in this section we are going to spend some time learning how to Dockerize applications which rely on different services to run. Just like it’s a good strategy to decouple your application tiers, it is wise to keep containers for each of the services separate. Each tier is likely to have different resource needs and those needs might grow at different rates. By separating the tiers into different containers, we can compose each tier using the most appropriate instance type based on different resource needs. This also plays in very well with the whole microservices movement which is one of the main reasons why Docker (or any other container technology) is at the forefront of modern microservices architectures. The app that we’re going to Dockerize is called SF Food Trucks. My goal in building this app was to have something that is useful (in that it resembles a real-world application), relies on at least one service, but is not too complex for the purpose of this tutorial. This is what I came up with. The app’s backend is written in Python (Flask) and for search it uses Elasticsearch. Like everything else in this tutorial, the entire source is available on Github. We’ll use this as our candidate application for learning out how to build, run and deploy a multi-container environment. Now that you’re excited (hopefully), let’s think of how we can Dockerize the app. We can see that the application consists of a Flask backend server and an Elasticsearch service. A natural way to split this app would be to have two containers – one running the Flask process and another running the Elasticsearch (ES) process. That way if our app becomes popular, we can scale it by adding more containers depending on where the bottleneck lies. Great, so we need two containers. That shouldn’t be hard right? We’ve already built our own Flask container in the previous section. And for Elasticsearch, let’s see if we can find something on the hub. Note that if you are using Elasticsearch version 5 or higher you need to do the following to make it work. Increase the memory size of your docker-machine instance to at least 2gb. Do an SSH in your docker-machine instance by docker-machine ssh and run this command sysctl -w vm.max_map_count=262144. This will fix the max virtual memory areas error. Note: if you find that an existing image doesn’t cater to your needs, feel free to start from another base image and tweak it yourself. For most of the images on Docker Hub, you should be able to find the corresponding Dockerfile on Github. Reading through existing Dockerfiles is one of the best ways to learn how to roll your own. Quite a few new things here so let’s quickly go over this file. We start off with the Ubuntu LTS base image and use the package manager apt-get to install the dependencies namely – Python and Node. The yqqflag is used to suppress output and assumes « Yes » to all prompt. We also create a symbolic link for the node binary to deal with backward compatibility issues. We then use the ADD command to copy our application into a new volume in the container – /opt/flask-app. This is where our code will reside. We also set this as our working directory, so that the following commands will be run in the context of this location. Now that our system-wide dependencies are installed, we get around to install app-specific ones. First off we tackle Node by installing the packages from npm and running the build command as defined in our package.json file. We finish the file off by installing the Python packages, exposing the port and defining the CMD to run as we did in the last section. In the first run, this will take some time as the Docker client will download the ubuntu image, run all the commands and prepare your image. Re-running docker build after any subsequent changes you make to the application code will almost be instantaneous. Now let’s try running our app. Before we talk about the features Docker provides especially to deal with such scenarios, let’s see if we can figure out a way to get around the problem. Hopefully this should give you an appreciation for the specific feature that we are going to study. Okay, so let’s run docker ps and see what we have. So we have one ES container running on 0.0.0.0:9200 port which we can directly access. If we can tell our Flask app to connect to this URL, it should be able to connect and talk to ES, right? Let’s dig into our Python code and see how the connection details are defined. To make this work, we need to tell the Flask container that the ES container is running on 0.0.0.0 host (the port by default is 9200) and that should make it work, right? Unfortunately that is not correct since the IP 0.0.0.0 is the IP to access ES container from the host machine i.e. from my Mac. Another container will not be able to access this on the same IP address. Okay if not that IP, then which IP address should the ES container be accessible by? I’m glad you asked this question. You can see that our container e931ab24dedc is listed under the Containers section in the output. What we also see is the IP address this container has been allotted – 172.17.0.2. Is this the IP address that we’re looking for? Let’s find out by running our flask container and trying to access this IP. This should be fairly straightforward to you by now. We start the container in the interactive mode with the bash process. The --rm is a convenient flag for running one off commands since the container gets cleaned up when it’s work is done. We try a curl but we need to install it first. Once we do that, we see that we can indeed talk to ES on 172.17.0.2:9200. Awesome! The good news that Docker has a great solution to this problem. It allows us to define our own networks while keeping them isolated. It also tackles the /etc/hosts problem and we’ll quickly see how. Let’s first go ahead and create our own network. Now that we have a network, we can launch our containers inside this network using the --net flag. Let’s do that – but first, we will stop our ES container that is running in the bridge (default) network. We’ve done the same thing as earlier but this time we gave our ES container a name es. Now before we try to run our flask container, let’s inspect what happens when we launch in a network. Head over to http://0.0.0.0:5000 and see your glorious app live! Although that might have seemed like a lot of work, we actually just typed 4 commands to go from zero to running. I’ve collated the commands in a bash script. And that’s it! If you ask me, I find this to be an extremely awesome, and a powerful way of sharing and running your applications! Before we leave this section though, I should mention that docker network is a relatively new feature – it was part of Docker 1.9 release. Before network came along, links were the accepted way of getting containers to talk to each other. According to the official docs, linking is expected to be deprecated in future releases. In case you stumble across tutorials or blog posts that use link to bridge containers, remember to use network instead. Docker Compose – A tool for defining and running multi-container Docker applications. The background story of Docker Compose is quite interesting. Roughly two years ago, a company called OrchardUp launched a tool called Fig. The idea behind Fig was to make isolated development environments work with Docker. The project was very well received on Hacker News – I oddly remember reading about it but didn’t quite get the hang of it. So really at this point, that’s what Docker is about: running processes. Now Docker offers a quite rich API to run the processes: shared volumes (directories) between containers (i.e. running images), forward port from the host to the container, display logs, and so on. But that’s it: Docker as of now, remains at the process level. While it provides options to orchestrate multiple containers to create a single « app », it doesn’t address the managemement of such group of containers as a single entity. And that’s where tools such as Fig come in: talking about a group of containers as a single entity. Think « run an app » (i.e. « run an orchestrated cluster of containers ») instead of « run a container ». So what is Compose used for? Compose is a tool that is used for defining and running multi-container Docker apps in an easy way. It provides a configuration file called docker-compose.yml that can be used to bring up an application and the suite of services it depends on with just one command. Let’s see if we can create a docker-compose.yml file for our SF-Foodtrucks app and evaluate whether Docker Compose lives up to its promise. Now that we have it installed, we can jump on the next step i.e. the Docker Compose file docker-compose.yml. The syntax for the yml is quite simple and the repo already contains the docker-compose filethat we’ll be using. Let me breakdown what the file above means. At the parent level, we define the names of our services – esand web. For each service, that Docker needs to run, we can add additional parameters out of which imageis required. For es, we just refer to the elasticsearch image available on the Docker Hub. For our Flask app, we refer to the image that we built at the beginning of this section. Great! Now the file is ready, let’s see docker-compose in action. But before we start, we need to make sure the ports are free. So if you have the Flask and ES containers running, lets turn them off. Head over to the IP to see your app live. That was amazing wasn’t it? Just few lines of configuration and we have two Docker containers running successfully in unison. Let’s stop the services and re-run in detached mode. Unsurprisingly, we can see both the containers running successfully. Where do the names come from? Those were created automatically by Compose. But does Compose also create the network automatically? Good question! Let’s find out. First off, let us stop the services from running. We can always bring them back up in just one command. While we’re are at it, we’ll also remove the foodtrucks network that we created last time. This should not be required since Compose would automatically manage this for us. Great! Now that we have a clean slate, let’s re-run our services and see if Compose does it’s magic. You can see that compose went ahead and created a new network called foodtrucks_default and attached both the new services in that network so that each of these are discoverable to the other. Each container for a service joins the default network and is both reachable by other containers on that network, and discoverable by them at a hostname identical to the container name. Let’s see if that information resides in /etc/hosts. PING es (172.18.0.3) 56(84) bytes of data. Voila! That works. So somehow, this container is magically able to ping es hostname. It turns out that in Docker 1.10 a new networking system was added that does service discovery using a DNS server. If you’re interested, you can read more about the proposal and release notes. In the last section we used docker-compose to run our app locally with a single command: docker-compose up. Now that we have a functioning app we want to share this with the world, get some users, make tons of money and buy a big house in Miami. Executing the last three are beyond the scope of tutorial, so we’ll spend our time instead on figuring out how we can deploy our multi-container apps on the cloud with AWS. If you’ve read this far you are much pretty convinced that Docker is a pretty cool technology. And you are not alone. Seeing the meteoric rise of Docker, almost all Cloud vendors started working on adding support for deploying Docker apps on their platform. As of today, you can deploy Docker apps on AWS, Azure, Rackspace, DigitalOcean and many others. We already got a primer on deploying single container apps with Elastic Beanstalk and in this section we are going to look at Elastic Container Service (or ECS) by AWS. Luckily for us, ECS has a friendly CLI tool that understands Docker Compose files and automatically provisions the cluster on ECS! Since we already have a functioning docker-compose.yml it should not take a lot of effort in getting up and running on AWS. So let’s get started! The first step is to get a keypair which we’ll be using to log into the instances. 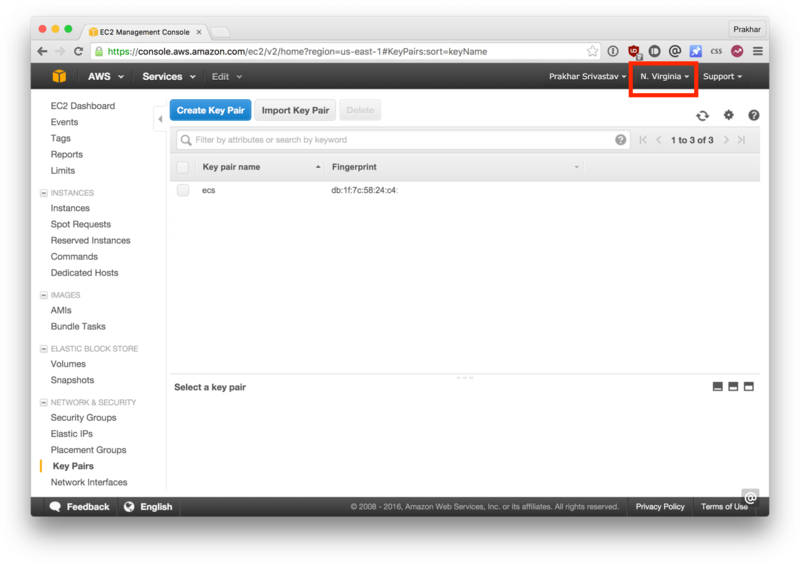 Head over to your EC2 Console and create a new keypair. Download the keypair and store it in a safe location. Another thing to note before you move away from this screen is the region name. In my case, I have named my key – ecsand set my region as us-east-1. This is what I’ll assume for the rest of this walkthrough. We provide the configure command with the region name we want our cluster to reside in and a cluster name. Make sure you provide the same region name that you used when creating the keypair. If you’ve not configured the AWS CLI on your computer before, you can use the official guide, which explains everything in great detail on how to get everything going. The only changes we made from the original docker-compose.yml are of providing the mem_limit and cpu_shares values for each container. We also got rid of the version and the services key, since AWS doesn’t yet support version 2 of Compose file format. Since our apps will run on t2.micro instances, we allocate 250mb of memory. Another thing we need to do before we move onto the next step is to publish our image on Docker Hub. As of this writing, ecs-cli does not support the build command – which is supportedperfectly by Docker Compose. Great! Now let’s run the final command that will deploy our app on ECS! It’s not a coincidence that the invocation above looks similar to the one we used with Docker Compose. The --file argument is used to override the default file (docker-compose.yml) that the CLI will read. If everything went well, you should see a desiredStatus=RUNNING lastStatus=RUNNING as the last line. 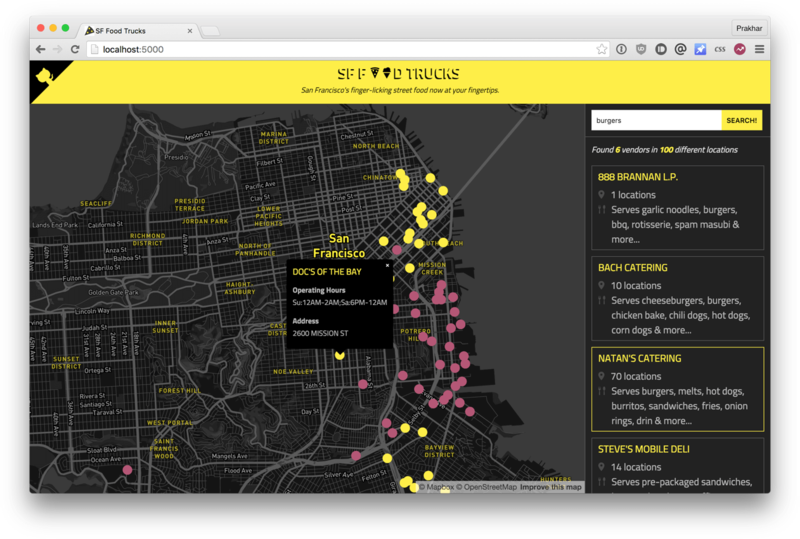 Go ahead and open http://54.86.14.14 in your browser and you should see the Food Trucks in all its black-yellow glory! Since we’re on the topic, let’s see how our AWS ECS console looks. 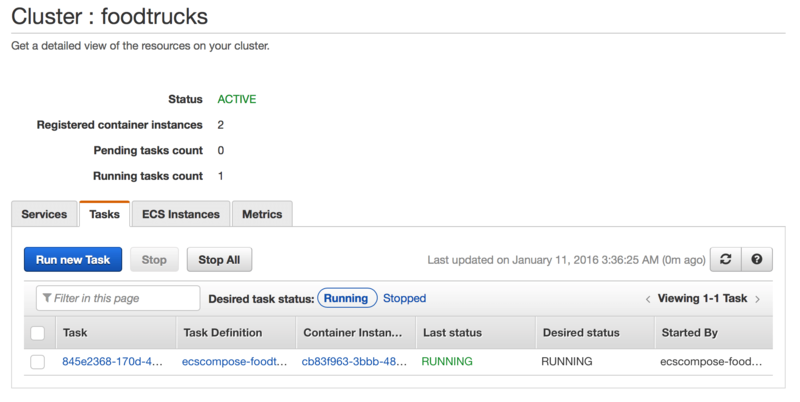 We can see above that our ECS cluster called ‘foodtrucks’ was created and is now running 1 task with 2 container instances. Spend some time browsing this console to get a hang of all the options that are here. And that’s a wrap! After a long, exhaustive but fun tutorial you are now ready to take the container world by storm! If you followed along till the very end then you should definitely be proud of yourself. You learnt how to setup Docker, run your own containers, play with static and dynamic websites and most importantly got hands on experience with deploying your applications to the cloud! I hope that finishing this tutorial makes you more confident in your abilities to deal with servers. When you have an idea of building your next app, you can be sure that you’ll be able to get it in front of people with minimal effort. Below are a few additional resources that will be beneficial. For your next project, I strongly encourage you to use Docker. Keep in mind – practice makes perfect! QUELLE EST LA DIFFÉRENCE ENTRE UN MOA (MAÎTRE D’OUVRAGE) ET UN MOE (MAÎTRE D’OEUVRE) ?